Occasionally we'll see a distracted parent on their grown child's wedding day desperately taking pictures to try to save the moment for themselves. 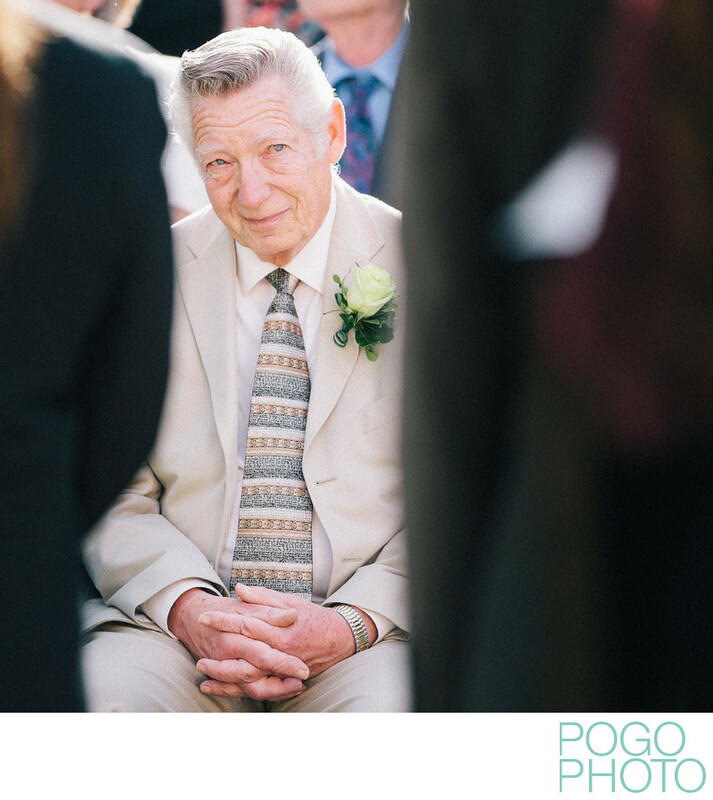 We see moments like this, with Kevin's father watching his son get married with tears in his eyes, and wish that every parent would stop, take a moment, and realize that being emotionally present is so much more important than a couple of extra snapshots. We've been hired to document the important moments between the couple getting married, but also to document the people who are witnessing this important moment, so that the ones speaking the vows will be able to go back later and see the pride and joy in their parents' eyes, and not the device in their hands. We chose to crop this image as a square because it draws your eye right to the subject's face, while the shoulders of the groomsmen block unnecessary detail of other guests in the background. This natural composition isolates the subject and creates a tunnel-vision effect that simulates what it feels like from the other side watching your child get married. Documentary photography of this style is exactly what we love about photographing weddings, and every detail matters. This is another reason why we prefer secular and/or outdoor settings for weddings: traditional church weddings sometimes (not always) place extreme restrictions on the photography and video teams. If this wedding had taken place in a strict church there is almost no chance we could have captured such a tender and sincere moment from this angle. But, since this wedding was in front of the lawn gazebo at the Publick House in beautiful Sturbridge, Massachusetts, we were provided with a wide range of angles and options for candid ceremony moments. Location: Publick House, Sturbridge, MA. 1/400; f/2.8; ISO 200; 200.0 mm.